Bad news for hipsters. 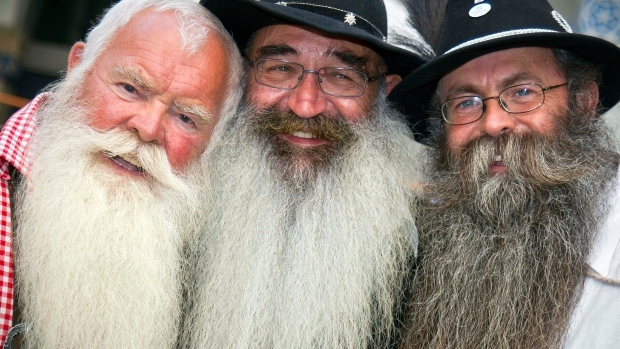 Beards carry more germs than dog fur, a new Swiss study claims. Scientists made the finding while trying to determine if it would be hygienic to assess dogs and people in the same MRI scanner. “The researchers found a significantly higher bacterial load in specimens taken from the men’s beards compared with the dogs’ fur,” Prof. Andreas Gutzeit, of Switzerland’s Hirslanden Clinic, wrote in the report. All of the men, aged 18 to 76, showed high microbial counts, whereas only 23 out of 30 dogs had high microbial counts and seven dogs moderate microbial counts, the report authors found. After the MRI exams of the dogs, the scanners were disinfected and showed a “significantly” lower bacteria count compared with levels seen when used by humans. But in Britain, Keith Flett from the Beard Liberation Front, which campaigns against “beardism and irrational prejudice against the hirsute,” cast doubt on the report. In a media release, the hairy campaigners said they do not believe the research is well founded and that versions of this story have been circulating since at least 2015. “Even though we doubt the credibility of beard/dirt research we do want to underline that the vast majority of beard wearers take great care with their beards,” Flett wrote.